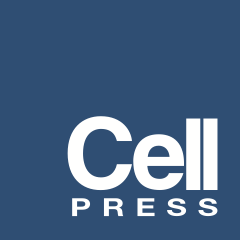 SUMMARY Recent studies have demonstrated that MyoD initiates a feed-forward regulation of skeletal muscle gene expression, predicting that MyoD binds directly to many genes expressed during differentiation. We have used chromatin immunoprecipitation and high-throughput sequencing to identify genome-wide binding of MyoD in several skeletal muscle cell types. As anticipated, MyoD preferentially binds to a VCASCTG sequence that resembles the in vitro-selected site for a MyoD:E-protein heterodimer, and MyoD binding increases during differentiation at many of the regulatory regions of genes expressed in skeletal muscle. 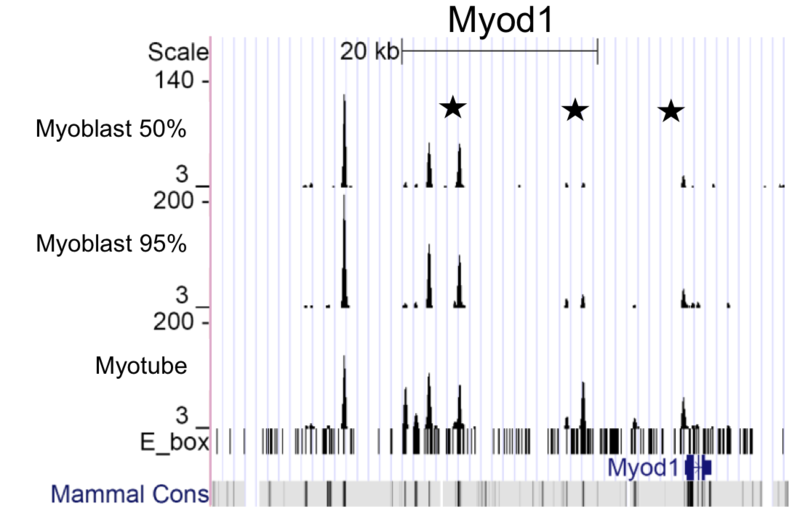 Unanticipated findings were that MyoD was constitutively bound to thousands of additional sites in both myoblasts and myotubes, and that the genome-wide binding of MyoD was associated with regional histone acetylation. Therefore, in addition to regulating muscle gene expression, MyoD binds genome wide and has the ability to broadly alter the epigenome in myoblasts and myotubes. DATA AVAILABILITY Raw data have been deposited in the Sequence Read Archive (SRA), accessions SRP001761 and SRA010854, and in the Gene Expression Omnibus, accession GSE20059. As a supplement to the raw SRA data, this web site provides processed results in formats suitable for viewing as "Custom Tracks" in the UCSC Genome Browser. Each data set is a browser "wiggle" track, provided in two different formats: a (gzip-compressed) .bedGraph file, and a .bigWig file. Download these files if desired (use the "Download" links), but most are very large. Conveniently, the .bigWig format allows the files to be viewed in the browser without downloading them to your computer. (Use the "View in Browser" links. Return and click additional ones to see several at once; the browser retains your preferences.) The .bedGraph files contain the same data. Most are too large to upload to UCSC, but this format may be more convenient for other analyses. The Full datasets give the coverage (locations and cummulative heights) of all Illumina Genome Analyzer II reads in our MyoD ChIPseq experiments mapped to the mouse mm9 genome assembly. The five experiments reported here are C2C12 myoblasts (50% and 95% confluency), C2C12 myotubes, mouse embryonic fibroblasts transfected with MyoD via a retroviral vector, and primary mouse myotubes. In all cases, "coverage" is defined by extending each mapped read in the sequencing orientation to a total of 200bp in length and counting the number of extended reads that cover each position in the genome. Reads from both genomic strands are combined. If you have problems with this web page, please contact ruzzo uw.edu.